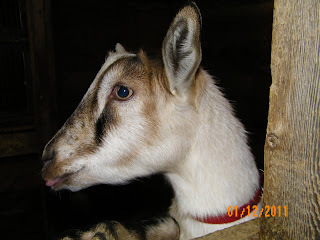 Spring Peeper Farm: Winter Fun! 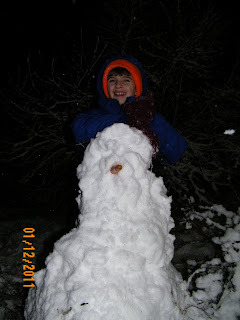 The following picture should be called "Crazy things kids will do when they are happy to see snow." Nuts huh. Yeah, I thought so to. When you leave for work when it's dark and get home when it's dark, you have to take pictures when you can. First snowman of the year. We haven't had all that much snow this year. It's really sad. Yes, I am one of those crazy people that love snow. Just call me the crazy cat/snow lady. That's me! A few hours after that photo was taken the snow was gone. Bummer. But! Alas! Yesterday we had our first snow day. The day started blah enough. It was giving snow, but it's given snow storms many times this year and we've gotten squat! Well God didn't forget us this time. No sireee!! Our cups runneth over! and over and over. The snow started around noon and by suppertime we had lots! But this story doesn't end happily for the snow people. Today it started to drizzle and the temps went above freezing. Crud. Oh well, this evening there still was lots of snow in our area. Five minutes from here, on the shore, there was almost nothing. I guess that's the good thing about living inland. Tundra loved the snow. We let her loose last night for awhile and her and J. had a ball. She is bigger than J. at the moment. So you see more of her than of him. Wanna play leapfrog? Or leapdog? 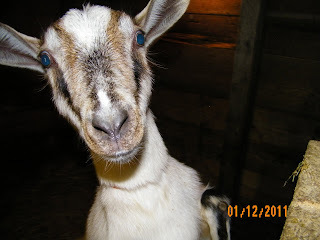 Last night when I was outside I had to go and take some goat photos. I've been neglecting them recently with the photography. So I treated them to photos and dulse. I smell the dulse, where is it????? Stop teasing us and give us the goods! Phew! 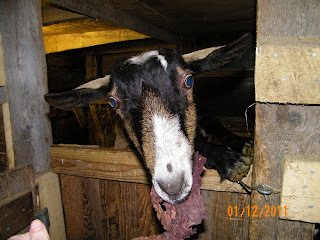 A nice mouthful of dulse. YUM!!! I took a photo for all you dulse virgins. 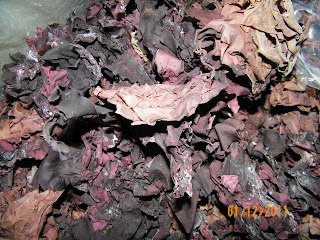 This is dulse. Nothing wow! Nothing spectacular. Just plain ole' dried seaweed. Good for you and for goats. This is dulse. Very appetizing, isn't it? 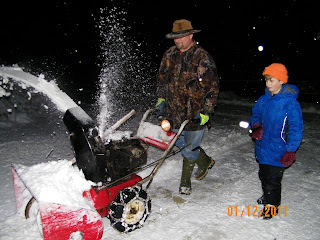 Dave was all happy to use his snowblower for the first time this year. Until the last 10 feet when the motor went KERBLEWY! Big hole in the side. Not fixable. Even Red Green can't fix this one. We are trying to find another second hand motor somewheres. Anyone have one? You've got to check it out. It's really new, so not too many people yet. But worth joining. 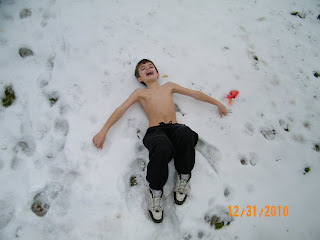 I can't imagine being out in the snow with no shirt on! 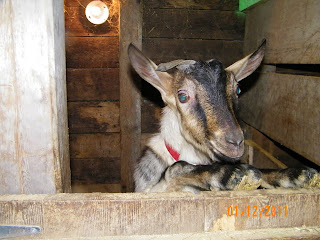 Your goats are really cute and I love dulse too. Silly kids, yeah I've got a few of them myself. No, I think they spread it outside on pavement on nice hot summer days and it dries. I get mine already done.